Ashley Myers, a sophomore animal science pre-veterinary student, said she felt “personally attacked” after her truck was vandalized. 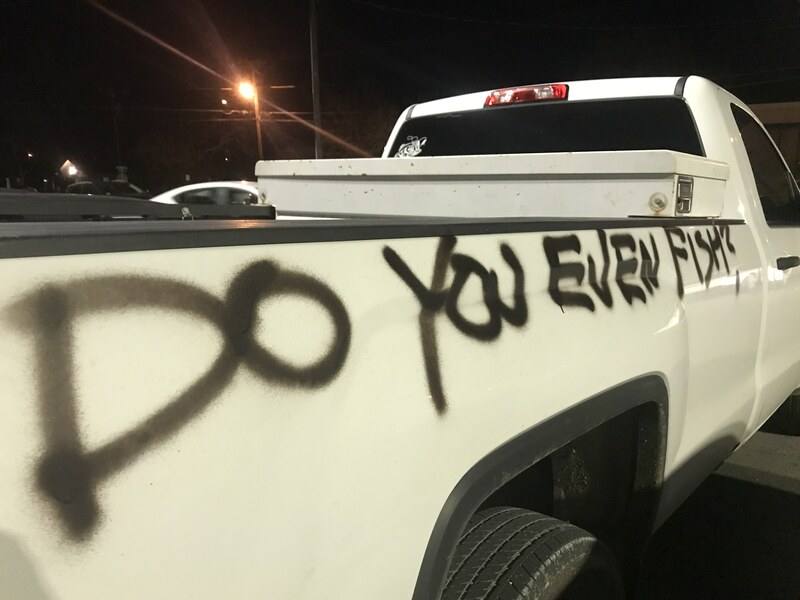 Myers said a friend of hers called her on Thursday and told her that someone spray painted “Do you even fish?” on the side of her truck bed. According to Myers, police filed a report and the investigation is still open but people have been questioned about the incident. Myers is not the only person in the area who has fell victim to truck tagging recently. Twitter user @JayBirdi3 tweeted pictures of trucks that were tagged. One of the pictures is Myers truck. In another picture, someone appears to have spray painted “Daddy’s $$$” on a different truck. “It irritates me to know that someone would think it’s funny to tag a truck, I work hard to make the payments,” said Myers. Fortunately, Myers said that strangers spent an hour helping her get the spray paint off her truck using non-acetone nail polish remover. Police are warning students to keep an eye on anyone who might appear to be watching people entering and exiting parking lots or “trying to stay in shadows.” If you see anyone acting suspiciously, you are urged to notify the police and call 9-1-1. University Police also suggest calling the University Police Department (254-968-9002) or Erath County Crime Stoppers (254-965-CASH) if you have information that can lead to an arrest.